Shifnal Cycling Society: Brian’s Last Stand – Going Out in Style! With the arrival of my new bike imminent, it seems only right to mark the retirement of ‘Brian’. Not before however, one last epic ride, and a chance to enjoy once more all that’s made him such a part of so many memorable rides over the last 2 years or so. Christened ‘Brian’ by my eldest daughter for obvious reasons, it all started with a chance conversation with a friend of mine. “I’ve got an old Rourke frame you can have if you want it” said Simon, “but it’s in a fairly bad way”. When I walked through the door with a rusty, and rather sorry looking frame over my shoulder after one of our regular Tuesday night rides, Mrs L was not so amused. But after a re-furb back at Rourke’s in Stoke, ‘Brian’ was restored to rude health, and the rest is history. I’ve completed some of the finest rides of my life on board ‘Brian’. 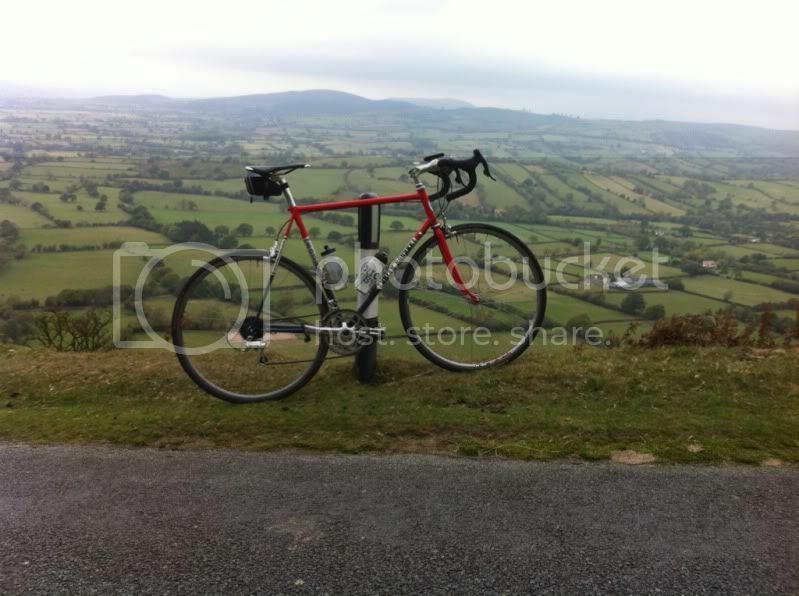 From the 21 bends of the legendary Alpe D’Huez, to our very own Tour of Shropshire. I’ve ridden him across Wales, as well as completing my longest ever ride on him. It’s not all been good though, and earlier in the year we came a cropper in a ford just outside Cressage. My superficial wounds soon healed, but Brian was left with a smashed shifter lever that well beyond repair. The culmination of his time as my #1 bike though would almost certainly be ‘The Shropshire Hills English Cogal’ that I organized in conjunction with Velominati. A day that had everything you could ever want from riding a bike. So back to the final ride. With a family and friends holiday booked down in the Forest of Dean in Gloucestershire, it was obvious. Whilst the kids and my eternally understanding VMH travelled down in the car, I’d use the opportunity to ride there. With a route plotted and the afternoon secured off work, it seemed the perfect way to enjoy Brian for one last time. The first 50km or so were on familiar roads as I headed South from Shifnal towards Kinver and Bewdley. From here on in, it was all new, and I wasn’t really sure what to expect. It was certainly a hilly one, and the 20% climb away from the ford(I used the bridge!) was a particularly lung busting section. Brian, as has been typical of our time together, soaked it all up. Quiet lanes and picturesque villages passed and the views across the Worcestershire roads were spectacular. 100km passed and I was in the home straight, surely. One last effort was required to get up and over the Forest of Dean, before being rewarded with a fantastic last 10km or so as I dropped off towards Parkend where we were staying for the weekend. I rolled into the campsite and rode the last few metres on Brian with mixed emotions. On one hand I’d be sorry to see him go, but I was sure the new bike would be a fitting replacement. Is Brian leaving the stable? Going to a new owner or kept as part of the family. I kept my vintage Mercian even after the new one arrived. Brian's leaving the (riding)stable, but will re-appear in a new guise. All will be revealed in a future blog i'm sure. So, what will the new machine be called?